On Thursday the EFF is due to formally propose the motion that the DA’s mayor of Tshwane, Solly Msimanga, be removed from his post. 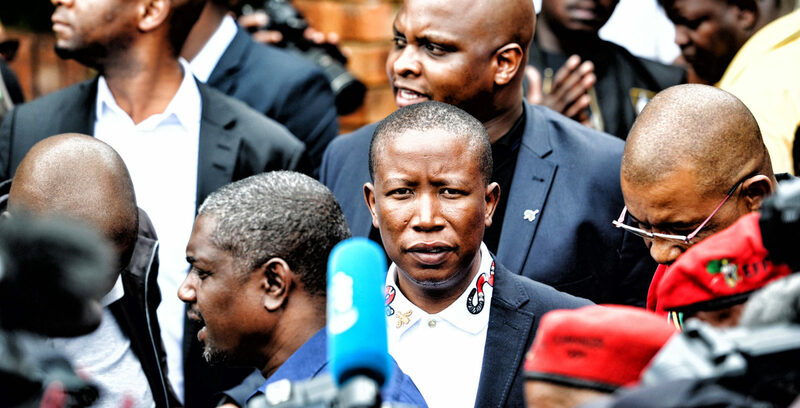 The motion will follow the EFF’s active support for a similar motion in Nelson Mandela Bay, which resulted in Athol Trollip being removed from his post in that city. In other words, by the end of this week, the DA’s control over metros might shrink from four to two. It is being reported that the EFF might not vote in favour of a new mayor in Tshwane, calculating that this interregnum might force an early election in the city. There is an incredible amount of politics at play right now, with both the local politics of the individual metros, and national politics ahead of the 2019 national election, playing out. It is a high-stakes game, and could play out over the next few months in a few different ways. In politics, sometimes, timing is absolutely everything. This appears to be the case here. It is surely no accident that after months of trying, an anti-DA coalition was finally able to remove Trollip in Nelson Mandela Bay in the same week that the EFF had planned to bring its motion to remove Msimanga. The EFF now has the aura of kingmaker in NMB, and may well have the aura of king-dethroner in Tshwane. The Sowetan newspaper suggested on Wednesday morning that the plan was for the EFF to vote in favour of the removal of Msimanga, and then, at the start of the voting process for a new mayor, to walk out of the chamber. That would lead to a situation in which the council would not be able to elect a new mayor, unless the ANC and the DA somehow agree on a candidate. If that situation were to carry on for too long, there would then be an early election in the city (this has already happened in Nquthu in KwaZulu-Natal, where the result of the 2016 elections meant no Speaker and mayor could be elected. In the end the IFP won the entire municipality). But why would the EFF support the DA in Tshwane in 2016, but remove them from power right now? The answer to that may well lie in the fact that the national elections are looming, and that it needs to move away from its ideological opponent. The political analyst Ralph Mathekga explained to The Citizen newspaper that “they want to show to their own voters that they do not have an alliance with the DA”. In other words, they want to stand on their own as an independent party. At the same time, it may well tie in with a much bigger question, which is what does Julius Malema want to do after the elections? Obviously, being in any kind of formal or informal coalition with the DA is difficult. But, if it were possible to get closer to the ANC, whether to rejoin them or just in the interests of bolstering his own power in the event of future coalition discussions, this might well suit that purpose. In other words, he’s crossing the floor, for his own political reasons. However, it is not necessarily as simple as that. For the ANC, the prospect of an early election in Tshwane could be very useful. The party itself called for such a thing during its press conference on Sunday, saying that “unholy coalitions” don’t work (of course, no mention of the situation in Ekhuruleni was offered). The ANC would probably love the chance to test, in the perfect political laboratory, whether it does in fact have more support than it did in a Gauteng urban area in 2016. Then, for various reasons involving one JG Zuma, many of its supporters stayed at home. What better way to test its support than a special election? President Cyril Ramaphosa himself, he who has the final authority on when a general election will be held, could even bring the 2019 polls forward or delay as much as possible, depending on the “test results” in Tshwane. At the same time, this is one of those moments when information, and in this case polling data, would be key. Both the ANC and the DA obviously regularly poll at national level, but might not necessarily have quite the same detailed information for Tshwane itself. The EFF seems unlikely to have access to such data (unless it was suddenly and inexplicably “shared” by Luthuli House), placing the EFF in the position of not knowing how it would do. Perhaps the closest we can come to publicly available polling information comes from Msimanga himself. On Wednesday morning he told SAfm that “ I don’t think that there would be a party that would win an outright majority this time. But I think the DA will do better than it did last time”. It would seem, on balance, that while the DA may have picked up more support simply through being in office, the ANC is likely to have picked up more support as well, simply because of Ramaphosa’s new leadership. This makes this, still theoretical, election very difficult to predict. However, the more interesting question might be how the EFF does. It will have been the party that has caused the chaos, voters may feel that Malema & Co should be punished for being dishonest or just changing their mind to suit the politics of the day. But it could also be that voters feel it should be rewarded, because the ANC has another chance to win complete control. Or it may just be rewarded for appearing powerful. Frankly, for the EFF in a Tshwane election, there is scope for shocks either way. In 2016 it won 11% of the vote (significantly more than it did in Joburg); that figure could easily fall down to around 5%, or climb to around 15%. But it is surely the case that the two other parties, the ANC and the DA, will have much bigger resources, and surely better organisation than the EFF. They will be able to flood the city with campaign staff, leaders, and money. The EFF will not, and its local structures have not necessarily stood the test of time. And it would absolutely be in the ANC’s interests to reduce Malema’s power (and obviously in the DA’s interests as well) so close to a national election. At the same time, just to add to the variables, there is the issue of race, which appears to becoming even more of a defining feature in our politics than it once was. Speaking on SAfm on Wednesday morning, Auwal SocioEconomics Research Institute analyst Ebrahim Fakir suggested that this could become a big issue in any local poll. He suggests that a certain narrative is being deliberately created around this, and that “when (issues of race) are used for narrow purposes, one has to go and scratch beneath the surface to see what they are actually saying. And in this instance, what you have now laid bare is the use of race to mask political decisions which are made to destabilise institutions and to give narrow advantage to one or other political party”. Again, this makes any outcome difficult to predict. There is another curiosity to all of this. Trollip was removed from power in NMB on Monday night, and a new mayoral committee, featuring several ANC councillors, was appointed by the new UDM mayor Mongameli Bobani. There has still been no formal comment from Luthuli House on this. It would have been normal that they would have something to say on the matter, and yet there has been only silence. The party has finally announced it will provide a formal response through its head of elections, Fikile Mbalula, on Thursday morning (and there is yet more history here, considering the close relationship that Mbalula and Malema once had in the ANC Youth League). Unfortunately, there is another problem which could actually prevent an early election altogether, no matter what the aims and wishes of the politicians. The Electoral Commission was back in the Constitutional Court on Wednesday, asking for more time to finish compiling the voters’ roll in a way in which the physical addresses of all voters are captured. This stems from the situation in Tlokwe several years ago. While it would not matter in a national election if this information had not been captured, it absolutely would in a local election (because people can be bused in to vote between councils, but it does not matter in a national election). The IEC is also stretched preparing for the 2019 national election. It may well plead with everyone to fold the elections into each other, in other words, if you live in Tshwane, you would be voting three times during the poll. But that, of course, would mean Tshwane does not have a working administration in all of that time. And the DA would be unlikely to accept any intervention from the province of Gauteng in such a situation.